Netflix had better watch out as it appears Amazon is attempting to move in on their territory when it comes to device support. Earlier today, Barclays downgraded its rating on the Netflix stock citing concerns over growing competition for the company. A few hours later that competition most certainly reared its ugly head as Amazon announced that its Prime Instant Videos are now available to stream on the PlayStation 3 console. One of the advantages Netflix has had for its Watch Instantly service is htat it has been available on just about every platform known to man. While Hulu Plus has been catching up with them, Prime Instant Videos has quietly been picking up more and more content licenses and bidding its time. With the jump on to the PS3, it looks like the ecommerce giant is ready to step things up a notch. Does this mean the death of Netflix? Not by a longshot, but it certainly means they should be watching their backs. (NASDAQ: AMZN – News) – Amazon.com, Inc. and Sony Computer Entertainment LLC (SCEA) today announced the launch of the Amazon Instant Video app for PlayStation 3 computer entertainment system, as well as an agreement to prominently feature the app on all PlayStation 3 game systems in the U.S. This makes the PS3 system the first and only video game console system to offer Amazon Instant Video. Customers can access Amazon Instant Video on their PlayStation 3 system for free by installing the Amazon Instant Video app directly from the TV/Video Services category on the XMB (XrossMediaBar). The Amazon Instant Video app can also be found in the PlayStation Store, under the Media & Apps category. 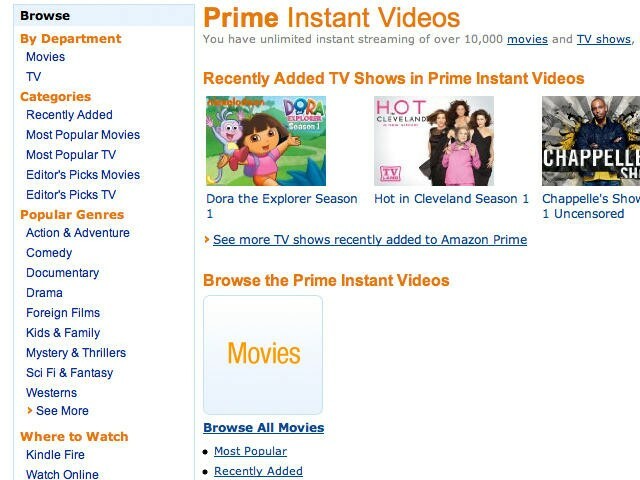 For more information on how to get started visit, www.amazon.com/instantvideo/ps3. Starting today, Amazon Prime members can watch Prime Instant Videos on PlayStation Network, streamed directly to their PS3 system. In addition to receiving free two-day shipping on millions of items and access to thousands of books from the Kindle Owners' Lending Library, Prime members can instantly stream more than 17,000 TV shows and movies, all for just $79 a year. Prime Instant Videos include hit TV shows like Glee, Downton Abbey and Sons of Anarchy and classic movies such as Office Space, The Graduate and Brokeback Mountain. Non-Prime members can start their free one-month trial today. The Amazon Instant Video app also offers more than 120,000 TV shows and movies to buy or rent, including the latest hit movies like The Descendants, Girl with the Dragon Tattoo and War Horse and popular TV shows like Mad Men, Vampire Diaries and Justified. Plus, to celebrate the launch of the PS3 system app, Amazon is offering the first episode of more than 100 TV shows for free instant streaming to both Prime and non-Prime customers. New smart lists such as Recently Watched, Next Episode and Personal Recommendations. These lists appear on the home screen of the PS3 system app and update dynamically based on what customers watch and buy. They make it easy for customers to find the next thing they want to watch – start watching an episode where they left off, watch the next episode in a series and introduce them to new TV shows and movies that they will love. Whispersync lets customers seamlessly switch from one device to another. Start streaming a movie on Kindle Fire, then pick up right where you left off on your PS3 system – avoid the frustration of having to find your spot. "PlayStation 3 is a powerful home entertainment system and is incredibly popular with our customers. Since the launch of Prime Instant Videos one of the top customer requests has been to provide customers with an app for PlayStation 3," said Bill Carr, VP of Video and Music at Amazon. "Pushbutton, which we acquired specifically for their expertise in TV entertainment app development, has done a fantastic job of developing our best video app yet. We are excited to deliver the PS3 app to customers today." "We're always looking for new ways to expand the digital entertainment offerings across PlayStation Network, and we're thrilled to be the first game console to deliver Amazon Instant Video to our community," said Jack Buser, senior director of PlayStation Digital Platforms, SCEA. "Working with Amazon is a prime example of our commitment to providing our community with a wealth of options so they can experience entertainment the way they want." Amazon.com, Inc. (NASDAQ: AMZN – News), a Fortune 500 company based in Seattle, opened on the World Wide Web in July 1995 and today offers Earth's Biggest Selection. Amazon.com, Inc. seeks to be Earth's most customer-centric company, where customers can find and discover anything they might want to buy online, and endeavors to offer its customers the lowest possible prices. Amazon.com and other sellers offer millions of unique new, refurbished and used items in categories such as Books; Movies, Music & Games; Digital Downloads; Electronics & Computers; Home & Garden; Toys, Kids & Baby; Grocery; Apparel, Shoes & Jewelry; Health & Beauty; Sports & Outdoors; and Tools, Auto & Industrial. Amazon Web Services provides Amazon's developer customers with access to in-the-cloud infrastructure services based on Amazon's own back-end technology platform, which developers can use to enable virtually any type of business. The new latest generation Kindle is the lightest, most compact Kindle ever and features the same 6-inch, most advanced electronic ink display that reads like real paper even in bright sunlight. Kindle Touch is a new addition to the Kindle family with an easy-to-use touch screen that makes it easier than ever to turn pages, search, shop, and take notes – still with all the benefits of the most advanced electronic ink display. Kindle Touch 3G is the top of the line e-reader and offers the same new design and features of Kindle Touch, with the unparalleled added convenience of free 3G. Kindle Fire is the Kindle for movies, TV shows, music, books, magazines, apps, games and web browsing with all the content, free storage in the Amazon Cloud, Whispersync, Amazon Silk (Amazon's new revolutionary cloud-accelerated web browser), vibrant color touch screen, and powerful dual-core processor. Recognized as the global leader and company responsible for the progression of consumer-based computer entertainment, Sony Computer Entertainment Inc. (SCEI) manufactures, distributes, develop and markets the PlayStation®2 (PS2) computer entertainment system, the PSP® (PlayStation®Portable) handheld entertainment system, the PlayStation®3 (PS3™) computer entertainment system and the PlayStation®Vita (PS Vita) portable entertainment system. SCEI has revolutionized home entertainment since they launched PlayStation in 1994. PS2® system further enhances the PlayStation legacy as the core of home networked entertainment. PSP® system is a handheld entertainment system that allows users to enjoy 3D games with high-quality full-motion video and high-fidelity stereo audio. PS3™ system is an advanced computer system, incorporating the powerful Cell Broadband Engine and RSX processors. PS Vita system is an ultimate portable entertainment system that offers a revolutionary combination of rich gaming and social connectivity within a real world context. SCEI also delivers the PlayStation® experience to open operating systems through PlayStation®Suite, a cross platform and cross device initiative. Headquartered in Tokyo, Japan, SCEI, along with its affiliated companies, Sony Computer Entertainment America LLC, and Sony Computer Entertainment Europe Ltd., and its division companies, Sony Computer Entertainment Japan and Sony Computer Entertainment Asia develops, publishes, markets and distributes hardware and software, and manages the third party licensing programs for these platforms in the respective markets worldwide.